It’s that time of year again: the eve of Summer, when the first hints of sunshine invite Sydney’s beach lovers back to the coast to reacquaint their love affair with sun, sand and surf. In the eastern suburbs, the enchanting Sculpture by the Sea exhibition has signalled the start of the beach season for close to two decades. Over two weeks, tens of thousands of Sydney siders descend on the tiny coastal strip between Tamarama and Bondi beaches to gaze at the outdoor art. Cameras and phones in hand, these beach visitors themselves become artists for a day. Many grumble about the crowds who flood along the paths and over the sculptures, making it impossible to take a ‘clean’ photo. But this is the beauty of Sculpture by the Sea. This is the beauty of our coast. What few among the crowds realise is that Tamarama Beach is free for them to enjoy because other people fought for it. For fifty weeks of the year, this part of Sydney’s coastline is relatively quiet and unremarkable. Burdened by an almost complete absence of parking, the cliff tops are occupied by the pram pushers, dog walkers and exercise fanatics who tread the five kilometres of pathways between Bondi and Coogee beaches with equal enthusiasm and regularity. Tamarama Beach, rated one of Sydney’s most dangerous, is home to a small group of hardy beachlovers: glamorous sunbakers and keen surf life savers and surfers. But this apparently unremarkable piece of coast has a remarkable history. It is the site of one of the most significant battles in the fight for free beach access in Sydney. The sculpture-lined pathways down which people stream from Marks Park to Tamarama thread across land that just 100 years ago was privately owned: farmland with a magnificent view. Its transformation into public space was the culmination of a battle waged by Waverley Council and local residents over half a century. 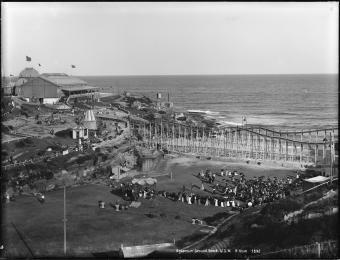 125 years ago in Sydney, the start of summer symbolised not surf but the start of the amusement season. When the Royal ‘Bondi’ Aquarium and Pleasure Grounds first opened at Tamarama Beach in 1887, thousands flocked to the coast each summer to see the sharks and other marine creatures in the aquarium, and to enjoy countless other novelties. This was not just an aquarium: it was Sydney’s first coastal amusement park. Two decades later ‘Wonderland City’ opened on the same site, modelling itself not on British forms of entertainment but on the newly emerging Coney Island amusement parks. It had a double storey merry-go-round, a switchback railway spanning the valley, a waxworks chamber, optical illusions, an aquarium and skating rink. The 800-seat theatre hosted vaudeville and circus entertainment, music and theatre, boxing and wrestling bouts and ‘Alice the elephant’. The owner placed advertisements in Sydney newspapers declaring Wonderland City to be ‘Australia’s Coney Island’, the ‘Greatest Amusement Resort on Earth’ and the ‘Federal Capital of Merriment’. Wonderland City, like the aquarium before it, enclosed Tamarama Beach with a wood-paling fence that wove its way around the cliff tops and kept all but paying customers from stepping foot on the sand. It was this fence, more than the amusement park itself, that local residents and the Waverley Council had constantly fought against since 1887. Responding finally to their campaigns, it was at Tamarama that the NSW Government admitted in 1904 the public had a ‘right’ of free access to the beach. Three years later, the Government purchased land for a public path to the beach, forcing the first free public access to this tiny strip of sand since the mid-nineteenth century. In the following years, consecutive state governments would buy back many more beaches along the ocean and harbour foreshores, embedding the concept of a public right to free beaches in the public psyche. In 1920, just under a decade since Wonderland City had closed its gates for the final time, the Waverley Council won its battle over this part of the coast, securing Tamarama’s northern headland and gully for public enjoyment. Fifteen years later the council expanded its investment, purchasing ten blocks along the cliffs immediately north of Tamarama to preserve the view and maintain open coastal spaces. These same spaces are today dotted by sculptures and swarming with crowds. All of this, of course, is history. But it’s a history that enables us to enjoy public art in a glorious coastal setting, without a thought for how this came to be. The biggest challenge most of us now face is where to find a parking spot. Read more about this and other fascinating stories from the history of Sydney’s beaches in Sydney Beaches: A History. 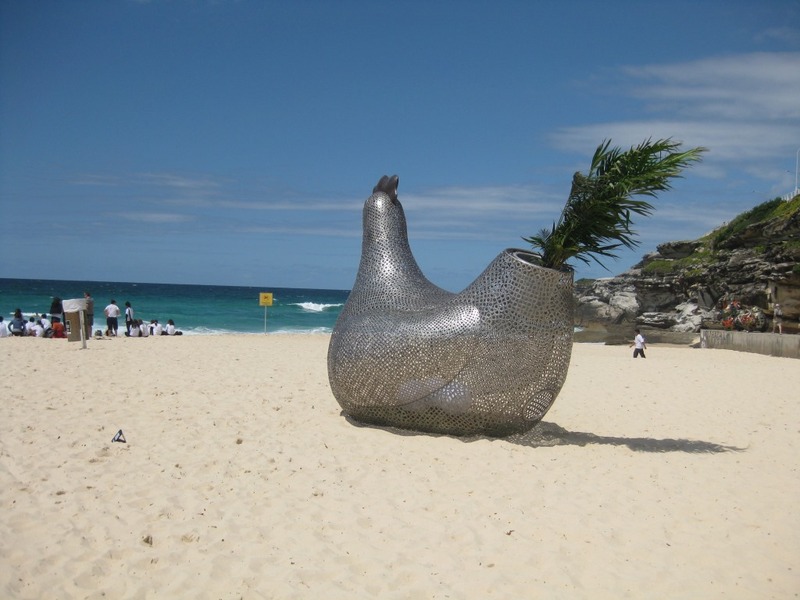 This entry was posted in Uncategorized and tagged art, Bondi, history, Marks Park, Sculpture by the Sea, Tamarama Beach. Bookmark the permalink.